The goal of Conservation Education is to “increase the level of public commitment to wildlife and fisheries conservation”. We are proud to provide education services for Conservation Education, Youth Programs and Firearms Safety. 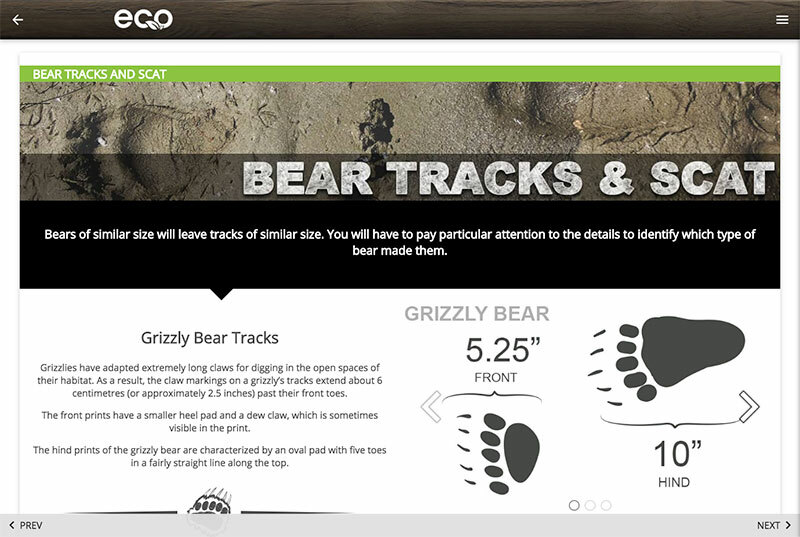 The Bear Essentials offers a comprehensive education. 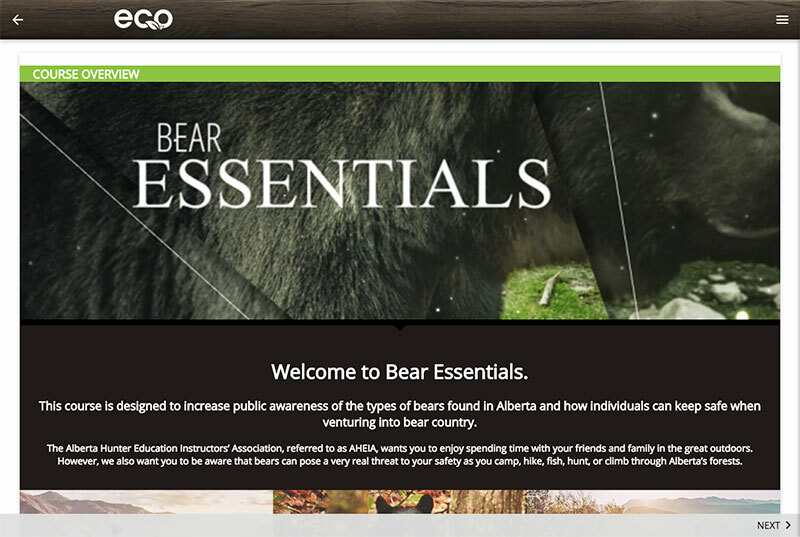 Utilizing interactive audio, pictures, narrations, simulations, videos, quizzes and a final exam, the Bear Essentials will equip individuals with the knowledge of the types of bears in Alberta, their habits and habitat, and how you can keep safe when venturing into bear country. 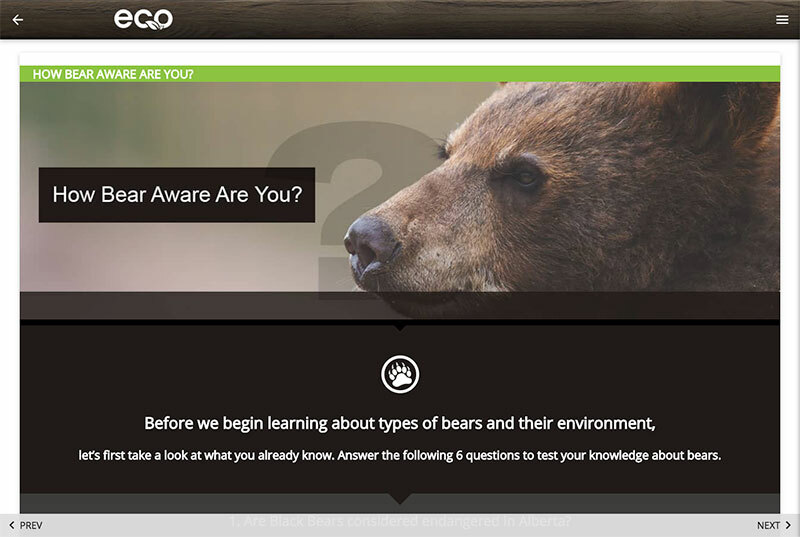 How Bear Aware are You? This course may be taken on-line from any internet enabled computer and can be paused and returned to at anytime. There is a minimum time requirement for each module. You must view the slide modules for the required amount of time before being permitted to move onto the next module and complete the course. Hunting and Conservation have always gone hand in hand. Hunter Education is a vital contributor to wise conservation practices today, tomorrow and the future. AHEIA is doing a wonderful job and will continue to do so. I thank you all for that. Working together, our organizations can have a positive impact on the future of hunting, fishing and habitat. Congratulations to the Alberta Hunter Education Instructors’ Association Volunteers and keep up the great work! AHEIA continues to do positive and pro-active work bringing on the next generation of Conservationists. Congratulations to all the Volunteer Instructors and keep up the great work! Volunteers play an integral role and I truly appreciate your efforts to educate residents about our connection with the outdoors, and the importance of conserving Alberta’s fish and wildlife resources. Importantly, your leadership helps inspire more stewards of our natural resources. The Alberta Hunter Education Instructors Association is clearly committed to conservation education and is known for its strong volunteer spirit. Albertans benefit from your values and knowledge and generations to come will appreciate your efforts. You are among the finest stewards of land in Alberta. Your work over 45 years has ensured the youth of the province continue to play an active role in conserving Alberta’s fish and wildlife resources. Your assistance in establishing Provincial Hunting Day as an annual event is appreciated. Alberta has benefited from 45 years of conservation education. More than 55,000 students took part in this program in 2008, and each year that number grows. With more than one million students since the program began, it is difficult to find a hunter in Alberta who has not been positively influenced by your conservation education programs. …this program is much more than a course on safe hunting practices. Course participants not only learn about conservation, they also become ambassadors, passing on knowledge and passion to their children, parents, friends and neighbors. For that and the many other contributions your organization makes to the quality of life in our Province, I thank you. I would like to thank the many volunteers in your organization who generously give of their time and wisdom. They are to be commended for their dedication, stewardship of our resources, and for being positive role models in the lives of others. My thanks to all of you for being ambassadors and educators in this great province. You reached a major milestone in in the one-millionth graduate of the Alberta Hunter Education program. Continued excellence is demonstrated by those involved in your organization that pass on their knowledge and passion to the next generation of hunters, anglers and trappers. Everyone involved with your wonderful organization has helped make Alberta a better place by inspiring and educating the next generation. For that, the Government of Alberta thanks you. Thanks for your dedication and hard work. It is no surprise that the number of hunters continues to increase in Alberta, bucking trends in other jurisdictions. You should be proud of this accomplishment. While hunting is a hobby for some, it is a way of life for others. Hunting is a life-skill and we must ensure the new generation of hunters is adept, responsible and knowledgeable. Thanks to the thousands of hunter educators across Alberta, our new hunters are well informed and will continue the tradition in good stead. You have inspired many Albertans by sharing your passion for our natural resources and leading by example. Together with Albertans like you, I know we can protect our natural legacy for future generations. This year marks the 50th Anniversary of conservation education across our province. I am pleased to note that more than 1.6 million Albertans have enrolled in conservation education programs, which are provided by more than 3200 volunteers. From the Outdoor Women’s Program, to instructor workshops, and Canadian Firearm Safety courses, the Association has consistently demonstrated its leadership on conservation education. 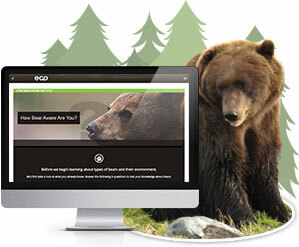 The Association continues to offer the online Hunter Education, Kidwise Firearm Safety, and essential training including the very popular Archery Essentials and Bear Essentials. All of these components add up to a strong and resilient culture of conserving wildlife, which takes the continuous commitment of each and every participant. The efforts of the association and its hard-working members play a crucial role in forging a culture of responsible and ethical hunting and fishing. As Albertans we look forward to many more years of successful conservation education programs, workshops, and activities. I appreciate your outstanding role in helping ensure that Alberta’s proud hunting and fishing tradition continues to play an important role in our culture and communities. For more than half a century, your growing success has resulted in the most successful education program of its kind in North America. Your dedication to educating Albertans about environmental stewardship and wildlife protection has created a legacy in the more than 1.8 million graduates of your programs. This year alone, the Alberta Hunter Education Instructors’ Association will reach almost 100,000 students Province wide through programs that teach all aspects of conservation education. Copyright © 2017 Alberta Hunter Education Instructors' Association All Rights Reserved.